You are here : DAQ FAQ»What are data loggers? 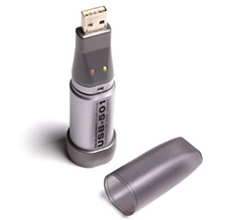 A data logger differs from a DAQ device in that it acquires its data independently and stores it in internal memory, a USB stick or Secure Digital (SD) card which can then be downloaded or transferred to your PC after the acquisition task has been completed. Some Loggers such as the Graphtec Midilogger series can display their data directly on an onboard screen. Others, such as the Measurement Computing LGR- 5320 series do not have the onboard screen preferring performance and value over the occasional convenience of the display. The heart of the DAQ or Logger is the analog signal conversion into a form useable by the PC. This is accomplished by the use of Analog to Digital Converters (ADC) and this article (insert link) explains ADC types in greater detail. ADCs are specified by their resolution and sampling speed. Resolution is specified in the number of bits or step size the analog signal can be broken down into. The greater the number of bits the smaller the step size will be and this means a smaller variation can be detected hence a higher accuracy can be achieved. Sample speed is important as this can be considered to be accuracy in the time domain. It is important to sample at a rate much faster than the highest rate of change you expect to monitor. There are two main implementations of sampling and they are Simultaneous and Aggregate. Simultaneous means that there is an ADC per sampled channel and Aggregate means that a range of inputs channels are multiplexed and then fed to a common ADC. Choosing the right device for your task. As discussed above resolution and sample rates are an important consideration but the number of channels and the types of sensors that can be connected is critical in choosing the right device for your application. Another factor is the input range or ranges. It is important to match your signal size to the most appropriate range provided by the DAQ device. If your signal varies from -5V to +5 volts then a +/- 5v range setting on your device would be ideal. Connecting a +/- 1 volt signal to a +/- 20 range would not be recommended. Similarly a +/-20v signal is not recommended for connection to a +/- 0.01volt input. If you wished to use thermocouples (TC) for temperature measurement then the inputs need to be capable of being configured for the various types of TCs. High sample speeds are not usually needed for temperature measurement. Of course your budget is also a factor and multichannel voltage input devices are priced from a little over $100.00 and a specialised mixed signal high speed device could range into many $1000s. See the MCC guide to signal connection (insert link) for details on signal connection.